All that and more is treated at great and careful length in Russian Roulette. Russian Roulette is not without flaws. The title promises an “inside” account, and while highly readable the book does not reveal much that was not previously reported. It is easy to get lost in Isikoff and Corn’s blitzkrieg of names and dates (keep a notebook handy), and their chronology is not always clear. Isikoff and Corn refer to Putin’s alleged subversion of “American democracy.” This may incrementally be true. And though outside the scope of this book, numerous detailed studies show that the majority of U.S. opinion is regularly trumped by the plutocratic power of the nation’s real owners: wealthy U.S. oligarchs, not Russian ones. At the same time, while Isikoff and Corn are focused on the Russian angle their narrative touches upon many aspects of the election that collectively are a damning statement about our supposed democratic process, with, for example, details about the DNC putting its thumb on the scale during the primaries in favor of Clinton. Also laid bare is the dismal and uninspiring Wall Street-funded listlessness of the Hillary Clinton campaign portrayed as frequently more concerned with winning than issues. Isikoff and Corn refer to Russian help as the “original sin” of Trump’s presidency, actually one of many sins, beyond the Russia focus, of a campaign and presidency also embracing racism, nativism, and abuse of women. 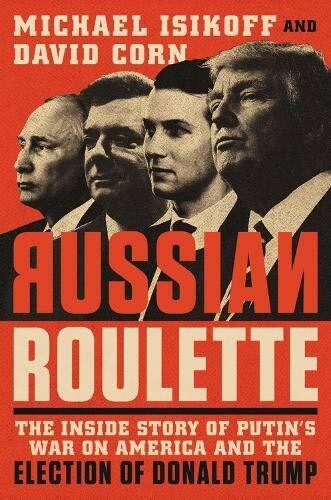 While Russian Roulette reveals little new information, and provides no firm evidence of crimes of collusion, it does create a narrative of many disparate facts, developments, and much that is conjectured as a single readable account. An imperfection of the book is that it is premature, as the full story of the Trump campaign and Putin’s Russia is not yet known, though the authors themselves acknowledge this complicated issue in the writing of the book. And to Isikoff and Corn’s credit, after reading this book, it strains credulity to posit that there is nothing odd, relevant, or problematic about Trump’s relationship with Russia and Putin. Read Russian Roulette knowing there are more chapters to be written in the Trump Russia saga. Until Mueller’s report (and studies informed by Mueller’s findings) come out, this book is the best and most accessible write-up of the RussiaGate narrative so far.